As Louise is drawn into David and Adele’s orbit, she uncovers more puzzling questions than answers. The only thing that is crystal clear is that something in this marriage is very, very wrong. But Louise can’t guess how wrong—and how far a person might go to protect their marriage’s secrets. 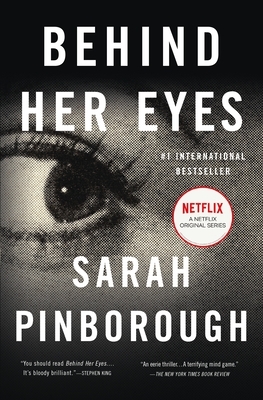 Sarah Pinborough is the award-winning, New York Times and internationally bestselling author of Behind Her Eyes and 13 Minutes. She lives in London. "Behind Her Eyes is a cunning puzzle-box of a novel, a masterfully engineered thriller that brings to mind Hitchcock at his most uncanny, and Rendell at her most relentless. Lean and mean, dark and disturbing, this is the kind of novel that takes over your life. Sarah Pinborough slays." "A masterpiece of suspense...A rare joy...Creates a sense of disorientation and dread that is highly satisfying. But it is with the plot, so tight and yet also intricate, that Pinborough shines. No detail or character is extraneous." "If Behind Her Eyes isn't the thriller of the year, there is no justice. Hugely entertaining, utterly compelling and the ending will leave you reeling."